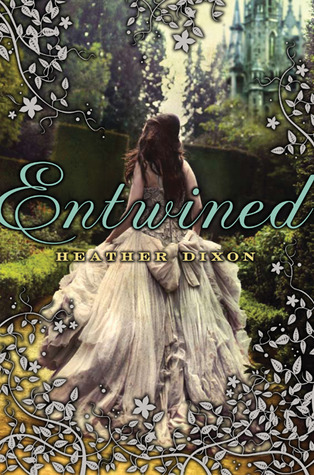 Let me just start this review off by saying that the cover and description of Entwined gives you one impression, but the book is actually completely different than what you would think. When I first picked it up, I was expecting this epic high fantasy romance, and that's just not what Entwined is about. It did not fall short of my expectations, it just changed them. As it turns out, Entwined isn't so much about the romantic love as it is about family love. Going into this, I didn't know this was a retelling of the Twelve Dancing Princesses fairy tale, so it was only after when I started reading some other reviews of it that I found out. That being said, looking back, I think Heather Dixon did an amazing job retelling the story. She took the basic structure of it and gave it a different life, adding her own story around the bones of the fairy tale. I thought the sisters were hilarious! There were 12 of them, and with so many characters it's easy to lose track of who they are, but each of the sisters has her own distinct personality that I didn't get them confused once. One is stubborn, one is shy, one is clumsy, one is romantic, the list goes on! They all had these weird, yet lovely names, so I don't quite remember them right now, but as you're reading, you should. Azalea, the main sister, is the oldest, and she basically takes on the mother figure after their mother dies. Even though the romance wasn't prominent, it was still there lightly drizzled throughout the story. There were actually quite a few romances, and I found myself rooting for them all. The unique personalities of each sister made this that much more fun, because they found men that complimented them. There was even a surprise romance that I did not see coming at all! Let me just say, the highlight of this book was the villain, Keeper. More like Creeper! Man, he was sooo creepy! I got goosebumps in the scenes that he was in. He would watch the girls as they danced, and just... ugh. But, I have to applaud Heather Dixon for being able to make a character so creepy that he was able to illicit such a reaction from me. Fans of the 12 dancing princesses fairy tale should absolutely pick this one up! And definitely any one who is a fan of fantasy. Not so much romance fans, but the romance is there. I enjoyed this book as well.I think the synopsis doesn't do the book justice. It's a great tale about family and I was very surprised by it as well.